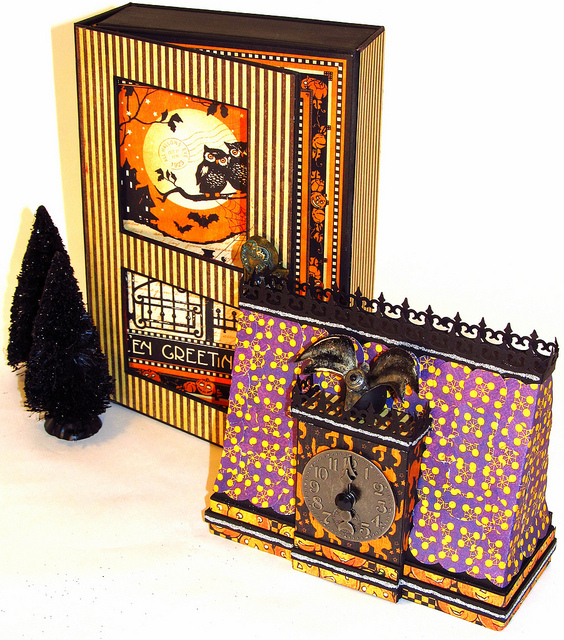 The Gentleman Crafter: Graphic 45 - Want2Scrap - Art Glitter Blog Hop Today! Good Morning Everybody... thanks for making it over to my new blog home! So far it's feeling pretty good! It's going to be a Fun day! We are having a Graphic 45 -Want2Scrap - Art Glitter Blog Hop! Yahooo! 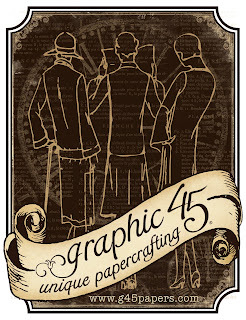 Graphic 45 an award-winning scrapbook and paper crafting company­— owned and operated by a mother and her two daughters. Together we create vintage inspired crafting products that capture the flamboyant style of the 1920's and 30's - with vibrant color, irresistible texture and imaginative design to create products with decades-old appeal that's both fresh and familiar. 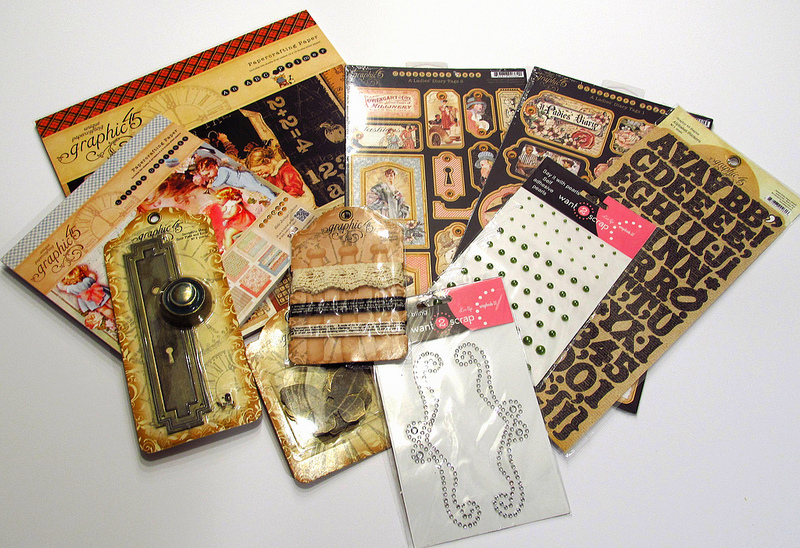 Let our products inspire your next scrapbook layout, card, album or home decor project. Want2Scrap™ manufacturers rhinestones lines including the specialty Nestabling™ line along with the newly released Nestaboard™ chipboard line that coordinates perfectly with the Spellbinders™ Nestabilies™ die templates. 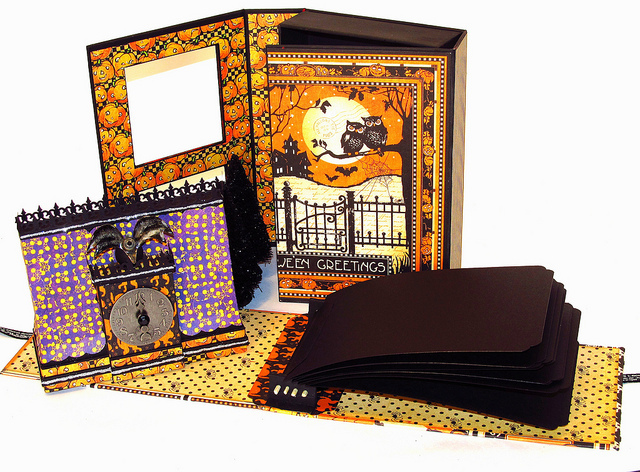 Want2Scrap™ also manufacturers their own line chipboard albums and accents, acrylic albums, and multi-layered laser designs and other fine scrapbooking products. Want2Scrap™ brings ease of use and flexibility in their product lines by offering products uniquely tailored to its customers’ needs. Spread the Sparkle! Be it cosmetics, scrapbooking, t-shirts, cards, jewelry, quilts, rock star toes, home decor or even cement...everything is better with Art Glitter on it! Barbara Trombley opened Art Institute Glitter, Inc. in 1982 and now supplies artists and artisans, crafters and craftsmen with more than 400 brilliant cosmetic quality glitter colors and industrial-strength adhesives. Art Glitter products have been featured on “The New Martha Stewart Show”, “Carol Duvall Show”, HGTV, Home Shopping Network and several times in “Martha Stewart Living Magazine” including this upcoming December, 2009 issue. Thousands of retail stores throughout the world carry Art Glitter products. Barbara’s first book, “Glitter Artistry: Bags, Tags & Cards,” was warmly received by artists in 2006 and is still a big hit today (Sterling Publishing, Inc.). Art Glitter’s retail showroom is located in Historic Old Town Cottonwood, Arizona. This week, Graphic 45, along with Want 2 Scrap and Art Glitter, will be having a blog hop filled with tons of inspiration and your chance to win one some cool prizes from both myself and Graphic 45! All you need to do is comment on the blogs as you hop! Here are the Graphic 45 Goodies they will be giving away! To win, simply become a follower of my blog and leave a comment under this post. The winner will be chosen at random on Monday, July 30th from the comment left here on my blog. WOW!!! Three chances for prizes!!! Today we will be hopping with two of my G45 teamies, Arlene Cuevas and Betto Cesare! Please Hop to each of the blogs and see their wonderfully amazing creations!! embellishments add to the haunting effect. Thanks For Hopping with me! Your haunted house is amazing!! I am a follower, congrats on the new blog! Jim this haunted house is off the charts. So freekin cool! You are amazing. Love the courtyard and fountain. So creative. Looks great over here. You will be all nestled in in no time. Wow! Very cool project! Love it. um I think this is a little over the top! LOL! OMG Jim this is an amazing piece- I especially love the choice of paper for the windows-it adds a jail like quality. and those light sconces made with the metal staples-so creative! awesome! Wow Jim that's incredible! "Hauntingly beautiful" I think! You never cease to amaze me with your ingenious creativity and this project is certainly fitting for your first over on your new blog. Where do you find the time to design yet alone complete these unique items? Always over the top with Jim. Love the new site. Another Wowee Project Jim! Love it!! Outstanding! You went above and beyond! OMG Jim!!! Halloween, in particular, is a favorite of mine. 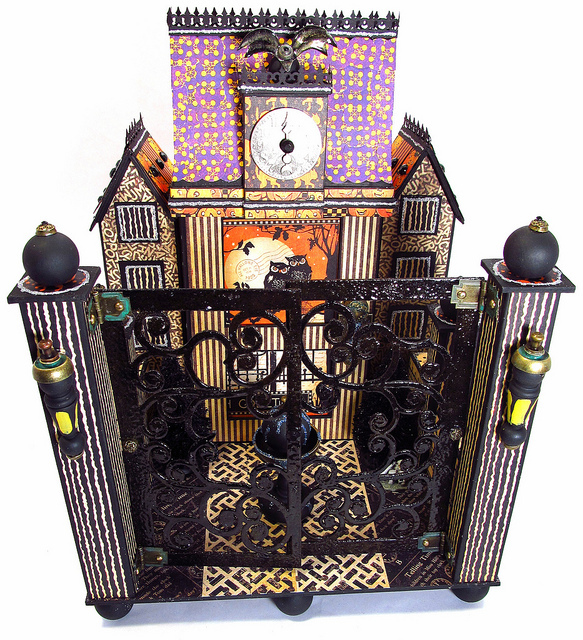 You have definitely captured the spirit (no pun intended...lol) of Halloween with this Haunted Mansion! Very cool! And of course I will follow your blog! I've subscribed by email. Okay this is so fantastically over the top that you definitely have earned the Crafters Hall of Fame award for most unique Halloween Mansion. Just one question can I come and Trick or Treat at these beautiful gates? Glad that you got moved over to Blogger! Hi Gentleman Jim! This project is simply stunning, thanks for sharing :) I am very happy to be a 'follower' - your talent is inspiring!! Very clever Jim...your designs really set off the paper!! Your projects never cease to amaze me. Where do you find the time? I really enjoyed the details on the fountain in the courtyard. OMG!!!! Awesome, you are so talented at makeing the most clever projects out of paper! Can't wait to see what you come up with next!! oh wow, Jim ....this is AWESOME!!!! i love halloween...this is just great!!! Gotta have one! Are the gates locked or can i come trick or treating there????? Fabulous as always...thanks for sharing your incredible talent!!! Are you kidding me!? Out of town for the previous week, setting up a technically complicated blog and this astonishing piece of art! Do you ever sleep?! love, love love it! It amazes me how you keep coming up with such creative ideas! really like the new blog...and of course i am following!!! just sayin! OMG!!! That is amaizing project!!! Loveee it!!! I can't say another thing... Loveee it!!! Thanks a lot for sharing! Big hugs.. Maggy :) P.D. I'm follower of your blog!!! Love it. Your projects just blow me away. Love the little fountain in the courtyard. You just got another follower. Jim, happy to follow you and drool over your magnificent creations. Keep inspiring! OmGosh! Love, love, love, the gates and the fountain, awesome! Love the little skulls, too ;o). It is "Spook-tacular"! Halloween is my favorite holiday and absolutely love this project. The added details to the roof is awesome. Love, Love, Love it. And will attempt to make something similar. WOW Jim! You are crazy talented and serious you must never ever sleep! "Must craft Zzzzzz, Must Craft Zzzzzzz"
Also... if you are ever short of video blog ideas. I would LOVE to hear about how and what you use to photograph your work. The shots are awesome! WOW!! My kids would just be over the moon over this project! One of your best!! And I am a follower! So happy you have found a new home for your blog!!!!! It looks great and your haunted house is amazing!!!!! I haven't done holloween in a while, since we never get trick or treaters at our house. It is to remote. But I now have 21/2 yr old grandaughters who would simply be thrilled with this. This will be the first year that they really understand holloween so I guess I am going to definitely have to dig out all of my holloween decorations, and step up my game with some new stuff. Can't think of a better project since this also incorporates a place to save the memories as well. Oh Jim What can I say. You have done it again. Love this too. WHAT??? You are nothing but amazing with your designs. The details of everything you create are beyond beautiful. I follow all your work and love it all. I love Halloween and collect vintage Halloween. Your Haunted House is stunning. Holy cow! That is amazing. I think I am good to just get a couple squares cut, stamped and glued to a card. You are building worlds! Wowie! Love this mansion! So many details I couldn't stop looking. You rock! WAUW! This is so cool! I love it, I want it! What an amazing idea. Of course I'm a follower! So easy to do so now! OMG! Jaw-dropping stunning...how do you find time to do all this?! Some many details to look at and be amazed by! Holy cow, Jim!! Wowzers!!! Eye popping gorgeous!! All the extra attention to details you did makes it magnificent!! First Congrats on your new "home". OH MY OH MY!! The haunted mansion is just so so so amazing. And no worries I will always be a follower. oh I am amazed with your artwork! OMG you haunted house is amazing. I love it! OMG!! Everytime you post a new project is just gets better!! Honestly, I don't know how you come up with so many new creative ideas. I'm awe struck once again. I'm already a follower and subscribe by email, too. Gorgeous!!! Will you be having a tutorial??? OMG YOU NEVER CEASE TO AMAZE ME - I AWISH I LIVED NEAR YOU SO I COULD COME OVER AND WATCH YOU CRAFT - DO YOU USE A LOT OF CHIPBOARD FOR YOUR STUFF?!!! AWESOME GENTLEMAN CRAFTER JUST FAB!! Oh my I am new at this art and you have blown me over with your creationss. I love the hourse and the album. You are a very creative person. Thank you so much for sharing. Hurray! It worked and I'm following you...I feel like I should make that gesture with my fingers to my eyes...I've got my eye on you? Seriously, so glad everything worked out. The house is amazing as usual. I am a new follower . WOW....your work is AMAZING !!! I love this Haunted House. I am Blown Away ....Thank you soooo much for sharing . I wish I could watch you create. And the hits just keep coming and coming. I want to come to your house and just quietly observe you for just one day. I need to see how you think all this stuff up! Just tell me when! Love it, love it, love it. Wow! What a project. Love the haunted house. Cute album too. Such talent. Great job. I am just blown away by this project!!! Really great work! WOW! I'm speechless. This is an amazing project and one of the best I've ever seen. The detail is amazing. Thanks for sharing something so special. What a wonderful Halloween project. This house is incredible. You always do amazing work. Thanks for your inspiration!!! Awesome is all I can say your projects are just Great and yes I will be following you also. Fantastic, and con grats with your new blog. I really hope that you can transfer the contents from your old blog. so much inspiration. Holy Wow! This is fantastic! LOVE the gate, and LOVE the hidden album. AMAZING! OK, this is the BEST I have seen...I want and need one!! I'm such a Hallowe'en fan and you truly made my day Jim! Thank you for sharing your creativity and inspiration with us, ^5!!! it is incredible and I would love to see it. I found you I found you I found you!!! Love the spooky castle! Wow, gorgeous work, the details are amazing! Love all your work, but this has to be one of my favorite. i love your work and love watching you progress i'm glad your new link was posted on graphic 45 love the new tag too! Love, love, love this. 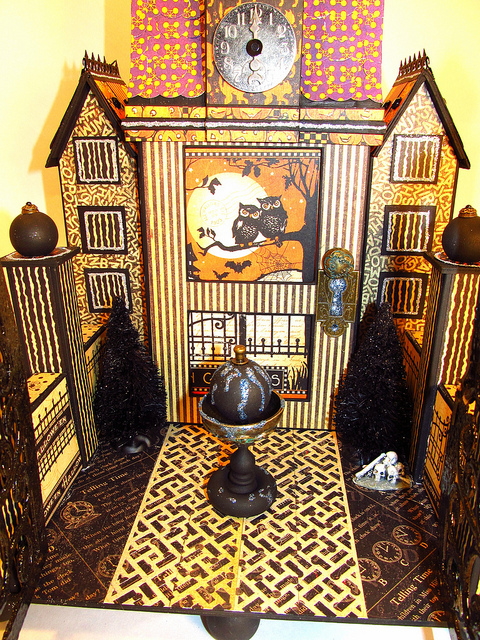 May even attempt to re-create to fit in with my Hallowe'en Lemax layout! Hands down...awesome talent! Love your creations. I wish you could hear the exclamation of my excitement upon seeing this wonderful project. First I beckoned for my daughter to come and take a look from the other room, cupped my hand over my mouth to stop my jaw from dropping any further, then shouted, "Oh, and it opens up" and "each section is a little treasure box", and "it even has a Mini Album inside, too". SOOOOO GLAD to have found your blog during this hop. What a talent you possess! Wow, Jim! What a project to start of your new blog home!!! Fantastic. So glad you got it up and running in time for the blog hop. Ok Jim. I think I clicked all the correct buttons - the computer said I'm now a follower. Wish I could see this sucker in person! It's flat out amazing! Thanks for the inspiration! Love the Haunted House and so excited that there will be more Chapters in the "Stephanie Plum" Blog on your new blog! I love! This is soooo cool. I love the new look of your blog and I am now a follower here (I used to follow via RSS). Great job! Great new home Jim! That Happy Haunting Haunted House is absolutely amazing! A true masterpiece! Whoa! Jim you've soared to a whole new level of creative genius here! Congratulations on your success and creative endeavors. It's mind-blowing! WOW!!!! A fabulous item of that there is no doubt. New follower to your blog popping over from the Graphic 45 Facebook page. Your work is amazing and looks so fantastic. Will be back to look at your future work. You are AMAZING! I started following you this year and fell in love with your creations. You always outdo yourself. You have been blessed with such a great talent. I look forward to seeing more of your work. 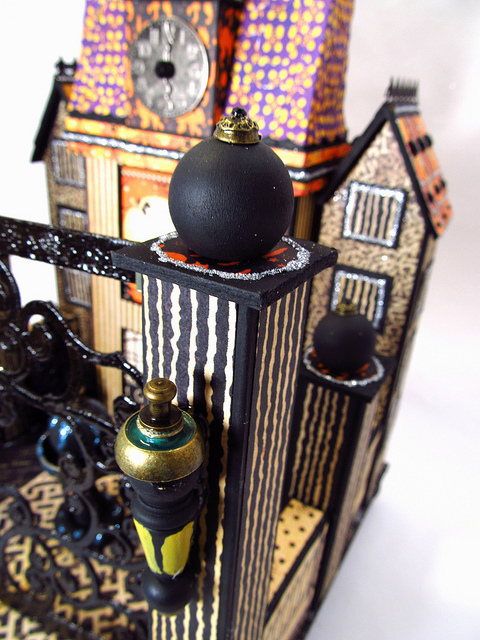 what a fabulous haunted house, I love your new Blog & I cant wait to see more. SHUT THE FRONT DOOR!!! A haunted house with a court yard?! SPECTACULAR!!!!!!!! Hi Jim, am VERY happy that you've become a Blogspotter! Delighted to join up and follow this version of your world too. 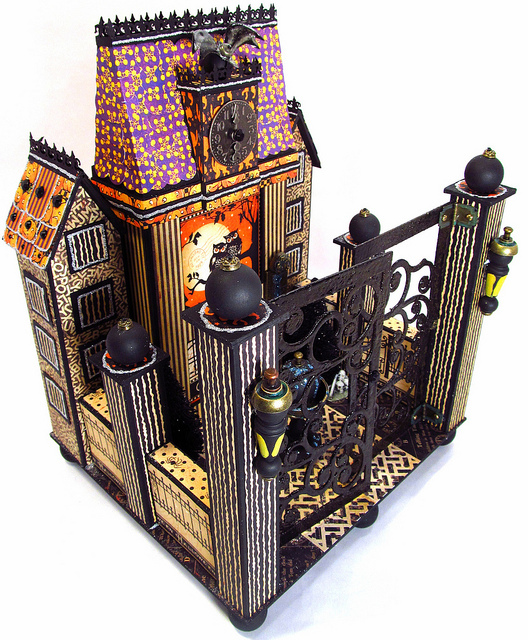 Another sensational project - each element a joy in itself, and then all put together to create the marvellous miniature model haunted house - fabulous! Wow!!! That is just the coolest thing I have ever, ever seen. Wow. So much to look at, so much wonderful detail, just incredible. Wow. Incredible doesn't even begin to describe this!! You are simply amazing. And a nice guy too! Oh Jim....it is WOWSA!...any change of a tutorial upcoming? Oh my Gosh...you've put a lot of effort into this beautiful project! Absolutely wonderful, I can't have enough of it! Waiting to see more...:) Thank you for sharing! Congrats on the move. Hope this will work okay for you. You know your fans will follow where ever you go. Love your haunted house. I'm into old wrought iron fences and love this one. Thanks for another fantastic project. OMG!!! You come up with the most amazing designs!! This is awesome!! Is that all you got? jk! This is unbelievably amazing!! I am a true fan of your style and work. Keep it up and thanks so much for sharing and being a part of the hop! Happy creating!!! Your Haunted Mansion is fantastic! You are an artist! Wow! I've joined your blog and will be checking out often now that I've seen it! TFS! What a radical Halloween House! Awesome!!! I am a follower! Amazing...simply AMAZING!!!! I love the attention to such details as in the lamp posts and the globe/fountain/statue in the courtyard...unfreakinbelivable!!!!! Ah ha! I found you. Most people I know are so fed up with blogger that they are leaving it to go to typepad. Your a brave soul Jim. This is a great project. So many details. Jim I was stuck over at your old blog and finally made it here. Worth the trip I tell you....that Hallo House is unfrickinbelievable! You are the man my friend. I can't describe how fantastic this project is. I didn't think you could top the ferris wheel but this sure does it. Woo Hoo! Wow!! Amazing work of art Jim! Love every detail the opening of the gate to the trees. It was all truly amazing to view and I am so happy I had the chance to see this. Thank you for sharing and so look forward to more of your wonderful work!! When I saw this I KNEW it had to be yours! AWESOME!!!!! LOVE the gates...and brilliant color combos! Wow! This is a piece of art! Love all the little details...just gorgeous!!!! OMG I think my heart stopped for a second when i saw the Haunted House!! I just love all things Halloween! This is spectacular-I hope you share a tutorial in the future!! I joined your blog! I just felt compelled since I love your work as do all of your fans. You make the best 3-D projects. They are so interactive and fun. Great job. O-M-Goodness This is amazing!! Will you be having a tutorial for this one? So glad you were able to find a new blog. Really? This is the most spectacular project I've seen in awhile! I am in love. Your work is fabulous. Of course I'm following. Wow! Your haunted house is absolutely amazing! I'm completely stunned! I'm now following your new blog. I am always glad you are on the visitation list. It is such an adventure to see what you have built. This is just...I don't know what to say. I found myself wondering if you sleep at all. Incredible. OMG!!! That is freaking amazing!!! Jim...your Halloween project rocks! Welcome to your new blog home and I am now an official "Follower". I am in Aweeeeee!! This is incredible! I absolutely love your attention to detail and how the altered piece is more than just a showstopper, it is functional as well. Sooooooo cute, Love, Love, Love was looking forward to the Wednesday Blog Hop so I could see what you have come up with this time. You never disappoint!!!!! QUESTION - Is there a difference between Following by email and Being a Follower? I do not know why I am so Follower challenged - I am actually pretty good with a computer. O.M.G!!! I was totally planning on making a haunted house decoration for this year's festivities and now I'm REALLY inspired!!! This is fantabulous!! Love, love, love the iron gates and all the little details - finials, lanterns, fountain. Thank you so much for sharing this with us! WOW!!! OMG!!! Sir Jim, you made my heart skip a bit when I seen this creation. I'm floored by your project and any of your projects. I'm so amazed by your skill level. For sure outside the box!! =) Thank you for sharing. Love your Halloween House, simply amazing.. I also love the new blog page looking forward to seeing what you come up with next. Here's hoping that you will be doing ustream shows soon..
WOW! I love, love, love the haunted house! You ARE Amazing! I can't get over how detailed this haunted house is. Each time I think that you can't go any bigger with your work....WHAM!...you throw out another one! Thank you for the chance. LOVE, LOVE, LOVE your new blog! I even subscribe because I could, with ease. This is so amazing so creative and so many details . I love it !! The creativity you share with us is outstanding. Totally love your work. Am definitely following your blog. WOW!! I am speechless! This is one of the most brilliant things I have ever seen! I am definitely a follower now. This is the kind of papercraft my husband loves, I'm afraid if I show him your blog my paper stash will quickly disappear LOL! Oh WOW!!! This is really SOMETHING! So much to look at!!! I have just recieved so much inspiration from your house! I am working on one of my own and I was looking for ideas! Amazing projects as always! Well, it looks like you made your move, I am here to follow you again. Love your stuff, that Scary Mansion is darling. Keep the ideas coming. I would love to see a doll house, I loved my doll houses when i was a little girl. You could use different G45 papers for each room and furniture. Just a thought! Pretty Please!! Love the house and love the new blog! Oh, my freakin' goodness! This is beyond incredible! The little mosaic walkway...the gated columns....the sweet owls overlooking the courtyard....I can't get enough of this! AND a mini album? You seriously, seriously rocked it out on this one! Oh, yeah...and the new blog is rockin'!!! JIM!JIM!JIM!!! You just WOW me with your amazing projects, your Haunted House is fabulously functional...MY GOODNESS such cool details...opening gate, lanterns on the post, courtyard fountain, owl picture, bling on the shingles OMG... the paper choices absolutely fabulous !!! Just when I think WOW there is no way he can top this project there you go making me a liar. THis is an awesome project. Way to go!!! This is just amazing Jim. It is awesome. Awesome Haunted House. Great details. Will definitely be following your blog. You dog, you! This is amazing! I hope it will be displayed where everyone can see it! WOW! WOW!!! That is amazing!! love it! Love the Happy Hauntings house, it's great!! Love the G45 paper too. Your creations are always amazing!! WOW Jim you have done it again. I love the haunted house. Like your Haunted House! I love it! I want to live in it! What an awesome home for that mini album, too. Mahalo for sharing. My first visit. Have signed up for email updates. Thanks for the wonderful site and the great inspiration. Absolutely love the haunted house. Laura from Follow the Paper Trail sujested your site. this is so cool. can you hop over to my house and decorate. this is so intricate and really grabs your attention. Absolutely wonderful! I am dying to get my hands on a tutorial for this. Also signing up for email updates ASAP! wowzers Jim. Your detail on all your projects is always spectacular. You never disappoint. If this was a ready-made item that you'd decorated, I would have been impressed -- but the whole thing came out of your head! BEYOND impressed... I'm gob-smacked. My Gosh, what a great project. Love it! Happy that blogger seems to be working better for you. Wow!!!! I can't even think of an adjective GRAND enough for this project!!! Truly AMAZING! I became a follower last blog hop and I have been so inspired ever since! I am glad I stumbled across your blog! Oh my goodness! Your blog is amazing...and your haunted house is ultra amazing! Love it...the details are perfect! WOW this is unbelievably awesome, how creative. Would have loved to have been a bug on the wall to watch the making of this wonder! So glad I saw your post so I could follow you on your new blog! Love your projects! Love the Graphic 45 paper. 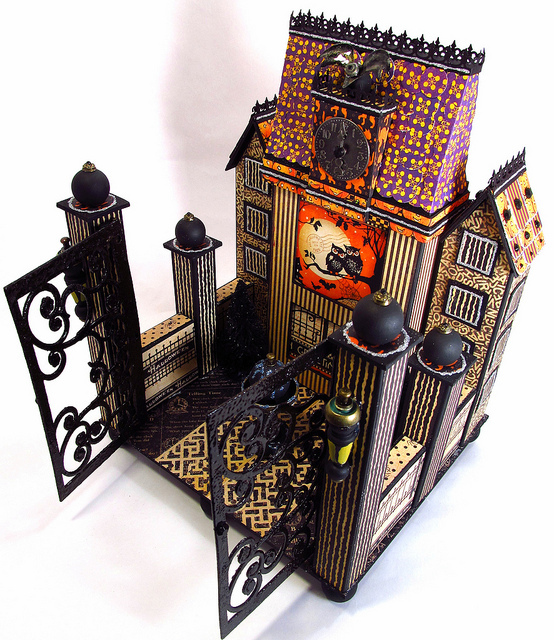 Wow, this is a fabulous haunted house, love how you turned the altered box into the house-very creative. This is utterly amazing. I don't know how you so it but, everytime it just gets better and better. Such an incredible piece, Jim --and such detail! I always love seeing your magnificent creations! Wow! That Halloween House is amazing. It's truly a stunning piece of artwork. I can't even imagine how much time went into that? Thank you so much for sharing and also for the inspiration. this is amazing! i always enjoy your creations! sorry if it is after midnight. i am in hawaii and just got in from a trip to the ER! dd is okay. whew! I LOVE the haunted mansion!! It is absoluty amazing in all it's details. I love the theme (halloween is definitely my favourite), the colours and especially the design. WOW!! You know how to keep amazing us all! I said it before and I'm going to say it again, you are without a doubt my inspiration. Thank you for sharing. I thought I posted a comment. I don't see it. But loved the Haunted Mansion!!! You are so talented. I don't know how you think these things up or where you find the time to make them. BTW...Love your t-shirt. That's my home state. Just love our state flag. Crescent Moon & Palmetto Tree. Clean and simple!!! This came great. I am loving this paper. Your Haunted House is simply AMAZING! I love it!! Your projects are so inspiring! You are a master crafter!! :o) I am always so excited to see what you will create next! It would be awesome to see what you and Laura would come up with together. (Maybe have a weekend workshop or something like that!!) looking forward to watching your live classes/ tutorials! Take care! I cannot find the words to say what I feel watching your creation! It's increadible!Thank you for inspiration! Thank you for sharing this creation. I dont even like Halloween stuff and I love this! AWK!!! Are you kidding me??? This is so incredible that I'm seriously sitting here with my mouth hanging open! 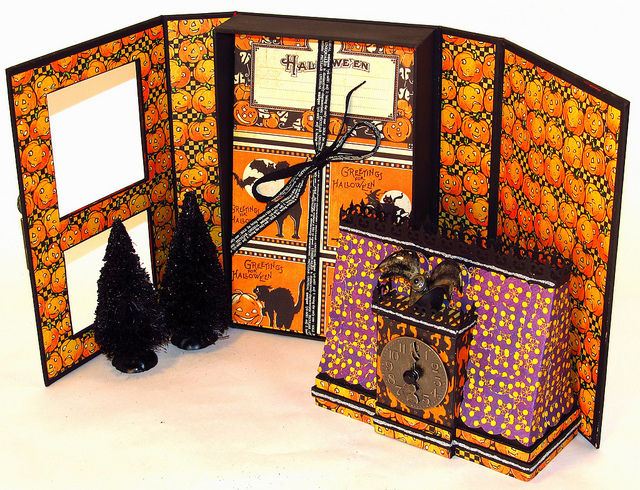 The Graphic 45 papers are just fabulous but that gate, and the album that tucks inside...and oh my goodness...just everything! Whew! I had quite a time following you over here from your old blog but wow was it worth it! You amaze me! I was a follower on your old blog, and now a new follower here!! Gobsmacked, how long did that take and the patience you must have. There is no question about me following you - I just want to see what amazing project you will come up with next. it's great to see some male inspiration - thank you. Oh my, mr. Gentleman crafter, I am at a loss for words looking at your creation! WOW WOW WOW! I just love it. I love Halloween. Believe you me, you are indeed an inspiration. 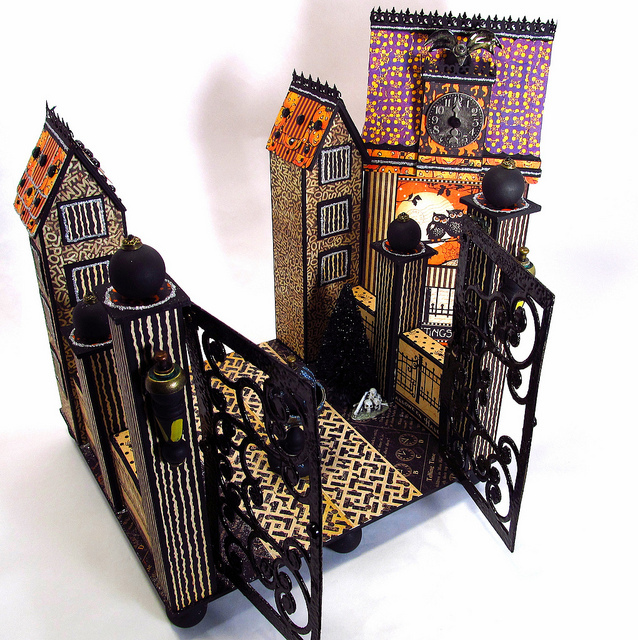 Rosemary Woodruff........I love the whole intricate architecture.....lol...and of course...I love this collection! That is one of the neatest things I have ever seen. I didn't even notice the book until the photo where you had it out and open. Absolutely awesome job! Love it. WOW, your creations are AMAZING. Welcome to your new blog home, Jim. I'm soooo glad I found you. This am I wondered why I had not received an update notification so went to your old site. Your haunted house is incredible - outstanding!